Just as your garden faces infiltration by bugs, so it does from disease. 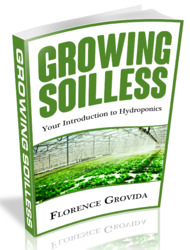 However, the wonderful thing about soilfree garedening is that there is no soil to harbor disease. Instead, you have only to contend with the nutrient solution. To avoid the growth of algae and disease causing organisms that may propagate within your nutrient tank, there are a few precautions you can take to avoid this scenario. First off, keep you nutrient temperature below 80 degrees F. Better yet would be to keep it from 68-72 degrees F., but in many cases this is difficult due to extreme ambient temperatures and strong sunlight heating up your reservoir. You can insulate your reservoir by keeping it out oif direct sunlight and covering it with reflective insulation such as Celotex board or foil-backed fiberglass. In extreme conditions, burying the lower part of the reservoir, or even the entire reservoir can keep it perfectly in check as the temperature of the earth remains much cooler and more constant. There is also the option of burying a coil of polyethylene tubing through which you pass your nutrient solution kind of like a chilling coil. Experimentation and discussion with growers in your area will yield many solutions. Keep your nutrient solution aerated and Oxygen rich by plumbing your system so that there is plenty of spray and/or bubbling water being generated by your pump. The nutrient returns should create a good splashing action inside your reservoir to maintain aeration and avoid nutrient stagnation. Algae is only a problem when your nutrient is exposed to light. 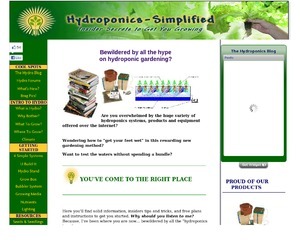 Be sure to use only opaque materials and tubing to construct your hydroponic garden. It is always a good idea to completely flush your system between crops with a 10% solution of hot water and bleach. Make sure you rinse it well after doing so. The best prevention against all plant problems as caused by external organisms is to keep your growing area sanitary. Remove any dead leaves, dust and dirt to avoid giving critters a place to grow and food to eat. Rarely will bugs attack a perfectly healthy plant as nature has devised for each its own line of natural defenses. Overwatering seedlings and cuttings will cause damping off - this is basically the growth of a fungus which attacks the plant tissue and eventually destroys the plant. See picture.